MT. HOPE, Ohio--(BUSINESS WIRE)--The Genie Company, the leading manufacturer of garage door openers and accessories, was featured on last night’s episode of “American Chopper” with the national debut of the custom-built Genie Chopper. The commissioned bike was expertly crafted by Paul Teutul, Jr., owner of Paul Jr. Designs and co-star of the revived fan-favorite series airing on the Discovery Channel. Teutul, a renowned designer and fabricator, designed the Genie chopper with iconic features exclusive to the Genie brand and incorporated those features as working components into the sleek, glossy look. The Genie Company team approached Paul Jr. last fall about creating a one-of-a-kind chopper that would reflect the American heritage of the company’s more than 60 years in business. Concurrently, they wanted it to convey the company’s innovative leadership in smart-connected, Wi-Fi enabled garage door openers. The team gave Paul Jr. brand standards to follow but left the final design completely up to him. By Q1 2018, the vision became a reality at the Paul Jr. Designs shop. Paul Jr. personally unveiled the bike in the Genie booth at the International Door Association’s annual IDAExpo in April. The Genie team is proudly displaying the chopper at their headquarters in Mt. Hope, Ohio. Stay tuned for more details and behind the scenes activities on the company’s Facebook, Twitter and Instagram pages. The Genie Company is based in Mt. Hope, Ohio, and is a leading manufacturer of garage door openers and accessories for residential and commercial applications, including smart Wi-Fi connected openers. With its main manufacturing facility in Baltic, Ohio, its roots run deep as an American brand that has been synonymous with garage door openers since 1954. The Genie name itself is a well-recognized icon among homeowners, builders, and dealers alike. Genie distributes its openers and accessories through a broad distribution channel of professional dealers, wholesalers, and retailers throughout the U.S. and Canada. The Genie Company is a separate division of Overhead Door Corporation. Learn more at www.GenieCompany.com. 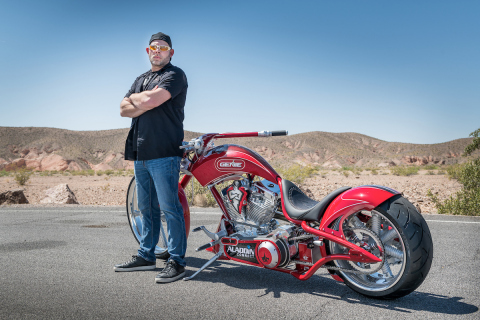 The Genie Company appeared on the June 18 episode of “American Chopper” debuting the custom-built Genie Chopper crafted by co-star Paul Teutul, Jr.